Shopping for a new home heating system can be overwhelming. With all of the different heating system options available, it’s no wonder why people get confused. You want a heating system that will keep you warm and comfortable for years to come. And considering that space heating is the most expensive utility cost in the average U.S. home (about 45% of energy bills), you also want to make sure it is energy-efficient. While this article is meant to introduce you to the different heating systems available, there’s only one way to really know which HVAC system is best for you—speak with a licensed HVAC professional. If you have any questions, you can always contact the Birmingham area experts at Ontime Service for advice on selecting the best heating system for your home. We highly recommend having a professional inspect your home for the best heating system replacement option. You don’t want to necessarily replace your existing system with a similar one. Many things must be taken into account to properly select and size your new heating system. Is it time to replace your furnace? If you are looking for a dependable, long-time consumer favorite then it is difficult to go wrong with a furnace. Forced air furnaces have been the most popular home heating system in the United States for years because of their efficiency, effectiveness, and reliability. Sometimes called a central heating system, a furnace heats the air and uses a fan to distribute heat through duct system. They are one of the more inexpensive systems to install, but they can be loud and pose certain risks, such as carbon monoxide poisoning, fires, and gas leaks. If you are more concerned about making your home more environmentally friendly while still keeping it comfortably warm, then you may want to consider a heat pump. Heat pumps, rather than consume a fuel to create energy, use electricity and refrigerant to transfer heat from the outdoors to the indoors. This makes them one of the more efficient, environmentally friendly options out there. In the past, homeowners in colder areas used to need a supplemental heating system for those really cold days when a heat pump would struggle to extract heat energy. Now, with advanced compressors and refrigerants, heat pumps are designed to work in cold climates as well. Heat pumps can be cheaper to install since one heat pump does the job of both heating and cooling your home. In terms of installing a new air conditioner and furnace versus the costs of installing a heat pump, the heat pump will be a less expensive option. If you already have an existing central air conditioner and furnace, however, this may not be the case. Usually, heat pumps are connected to a duct system, but there are also ductless models available. If your home cannot accommodate the bulky ductwork that forced air systems demand, a ductless mini split system may be right for you. They are also a good choice for separate dwelling units and add-ons where ductwork would be difficult or expensive to install. Ductless mini-split heat pumps utilize heat pump technology for both heating and cooling. What makes them different from traditional heat pumps is that there are multiple indoor units per one outdoor heat pump. Modern, energy-efficient units can accommodate up to 8 indoor mini-split units per one outdoor heat pump. By having separate ductless mini-splits, you can create HVAC zones in your home and have one area of the house at a different comfort level than other areas. The indoor units each have their own thermostat and can most likely be controlled from your phone as well. Plus, since there are no ducts to speak of, you won’t have to worry about duct leaks or inefficiencies. A central boiler heats up water to supply high-pressure steam or water that is then distributed throughout the building through a system of pipes. Today’s boilers generally use natural gas to heat water, around 145-190 degrees. The hot water can be distributed via radiators, hot water baseboards, or fin tubes. Less common home heating systems include geothermal, active solar heating, radiant heating, and electric heating. The efficiency of furnaces and boilers is measured by AFUE. The efficiency of heat pumps is measured by HSPF. If you’re in the process of choosing a new heating or air conditioning system for your home, then you’ll want to consult with the professionals. For instance, you may want to improve air sealing and insulation before replacing your HVAC system to save on a smaller unit. Unfortunately, according to ENERGY STAR, over half of all new heating and cooling are improperly installed. As a result, your system could be very inefficient, have poor air quality, and can cut its useful lifespan in half. Choosing the right system and sizing it properly requires the support of a trained professional. Don’t leave it to anyone. 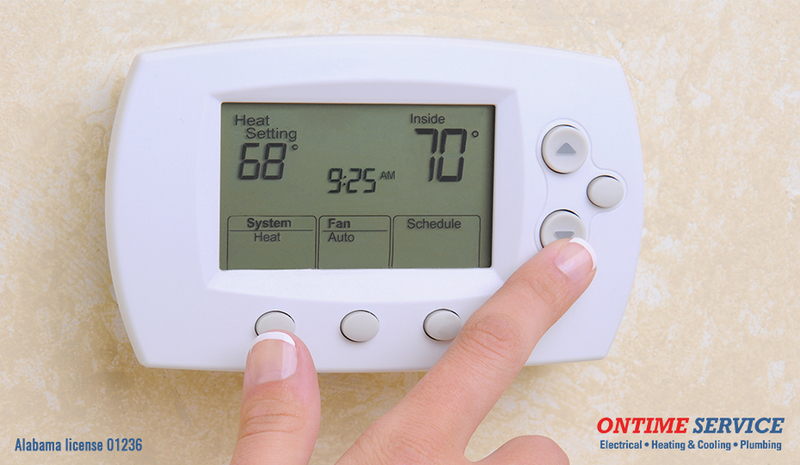 Trust OnTime Service to provide superior heating system replacements and upgrades that will stand the test of time.